Firefighters are exposed to potentially dangerous levels of ultrafine particulates at the time they are least likely to wear protective breathing equipment. Because of this, researchers believe firefighters may face an increased risk for heart disease from exposures during the fire suppression process. Coronary heart disease is the No. 1 killer of American firefighters, with many of these incidents taking place during or just after a firefighting incident. Researchers say exposure to these harmful ultrafine air particulates could predispose firefighters to heart disease—particularly in those at a less-than-optimal level of physical fitness or personal health. 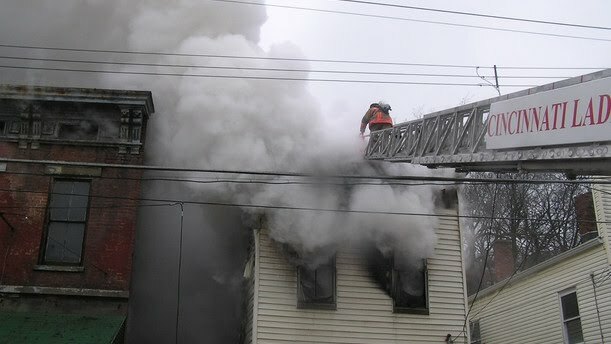 In a study conducted collaboratively by the University of Cincinnati (UC), Underwriters Laboratories Inc. and the Chicago Fire Department, researchers have found that more than 70 percent of particulates released during fires are "ultrafine," invisible to the naked eye but able to be inhaled into the deepest compartments of the lung. These findings were reported in the August 2010 issue of the Journal of Occupational and Environmental Medicine. This study was the first to characterize the size and distribution of particulates, including those in the ultrafine range, during domestic fires. For this study, researchers conducted a series of simulated house and automobile fires to measure the amount and specific characteristics of breathable particulates released during combustion and, consequently, what firefighters are exposed to during the course of their typical work environment. Fire suppression takes place in two phases. In the first, known as "knockdown," firefighters squelch the flames with water to avoid fire spread. Workers are required to wear protective breathing equipment during this time to avoid exposure to smoke and toxic gases produced from the process. During "overhaul," the second phase, firefighters enter the structure and work to prevent re-ignition of partially burned material. Researchers found that levels of ultrafine particulates were highest during overhaul, both in indoor and outdoor structure fires as well as automobile fires. "Firefighters simply can't avoid inhaling these ultrafine particles when they are not wearing their protective breathing apparatus and, unfortunately, they routinely remove it during overhaul," explains Stuart Baxter, PhD, a collaborator in the study and UC professor of environmental health. "Standard issue firefighting equipment weighs about 60 pounds, and under the exertion of firefighting the standard air tank only lasts about 20 minutes, so as soon as they determine the situation is safe—typically during overhaul—firefighters shed the protective gear," he adds. "Much of this ultrafine exposure could be avoided through equipment improvements and more rigid safety protocols for fire suppression—including additional workers who could be rotated in to reduce the physical and emotional burden of the job."